Power can give you an advantage in life. Let’s say, for example, you’re Shuhei Yoshida, avid gamer who happens to also be the head of Sony’s PlayStation game development studios worldwide. And say you’re stuck in a particularly difficult game. Maybe the PS4-exclusive Bloodborne. What to do? You could study the famously-challenging game for clues, maybe check online for hints. Yoshida, who recently told me at E3 that he has “platinumed” the Sony-published Bloodborne, does that, but added that, sure, he’s also asked the game developers for help. 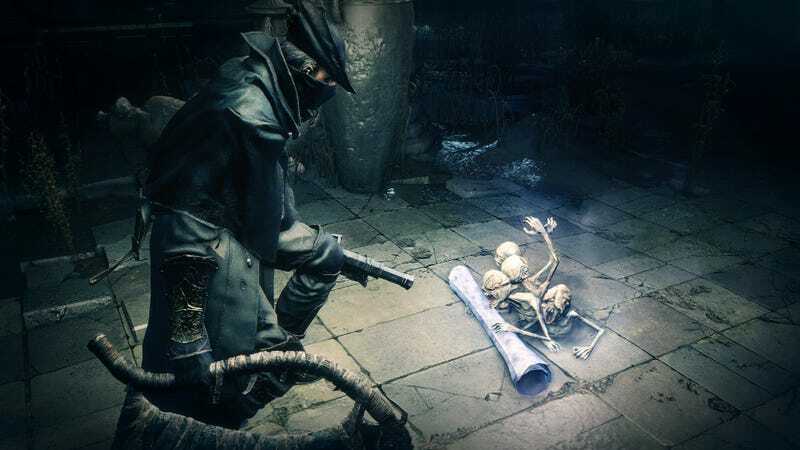 Given how notoriously difficult Bloodborne and From Software’s other Souls games are—and given that these games are designed with the assumption that players will ask others for help—I’m going to say this is an acceptable strategy. An advanced one, of course! Of course, when I met with Yoshida, I was trying to get some news about Sony games, including Bloodborne. Like, how’s that new DLC coming along? “It’s super-exciting,” he said. We laughed at how vague his answer was. “We are not talking specifics,” he added. “It’s a quite sizable effort. We will talk about more specifics some time later this year.” I asked him if they’d said when it would be coming out. They haven’t said. “I’d like to play it this year,” he noted. Hmm. Maybe Mr Yamagiwa knows what’s up.